This executive chef coat features a five-button closure on angled front, contrast piping on collar, roll-up sleeves with snap tab, moisture-wicking breathable mesh vent on back, one chest pocket, and split sleeve pocket. Center back length: 31". This eight-button coat features black knot buttons, piping trim around collar, moisture-wicking breathable mesh vent on back, roll-up split cuff sleeve with houndstooth trim inside, houndstooth trim on back neck, split sleeve pocket, and chest pocket with houndstooth band trim. Center back length: 29". This unisex chef coat features an eight-button front, stand-up collar, split sleeve pocket, french cuffs, two-piece back and a mesh upper back. Center back length: 29". 3 mitre pocket lab coat with classic tailoring, center back vent, and 2 button front. Regular center back length: 30". Long center back length: 31". Sleeve length: 24" - 25". 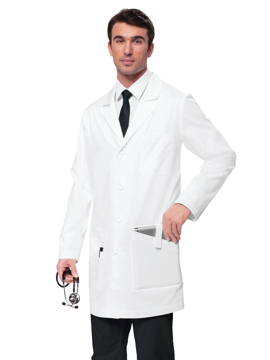 A men's two-piece vented back lab coat with a three button front closure, three outer pockets, and two lower inside pockets. Regular length: 30¾". 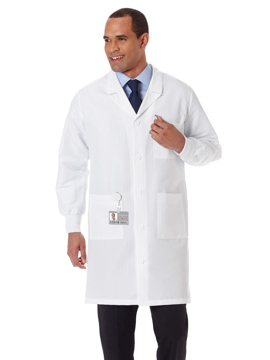 A men's two-piece vented back lab coat with a three button front closure, three outer pockets, and two lower inside pockets. Regular length: 30¾". Tall length: 32¾". This lab coat features a notch collar lapel and five cloth knot buttons along the front placket, providing a professional look with style and function. Two roomy lower patch pockets and a chest pocket with instrument division. Center back vent provides extra mobility at work. Center back length: 36¼". 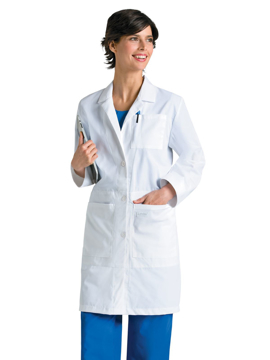 A traditional, full-length women's lab coat with one breast pocket with pencil division, two lower pockets, and two oversized inside pockets for your notebook or tablet PC. Also includes a mesh ID pocket, angled flaps to secure pocket contents, a three-button closure, sewn back belt, and kick vent. Center back length: 36¾". Two large front patch pockets. Chest pocket with pen slot. Hidden inside pockets. Open side access slits. Back vent. Waist-cinching sewn down back band. Center back length: 37". 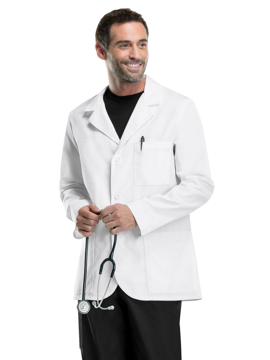 This lab coat features high filament polyester for increased fluid resistance, carbon fiber for static dissipation, button closure at neck for full coverage, deep back vent for lap coverage, back pleat, knit cuffs, and three pockets. Center back length: 40". Take your work day from mundane to legendary in Smitten's yoga inspired pant. This comfortable, full elastic waist band pant with drawstring ensures a perfect fit while two cargo pockets and two mini back pockets. Fashion back vent seam details and metal D-ring help you stay stylish. Regular inseam: 31". Petite inseam: 28½". Tall inseam: 33".